Use this guide as a general assessment of personal anchoring systems. Remember, learning about rock climbing online serves as a tool, but in no way are written articles a substitute for hands-on instruction. Failure to follow appropriate safety measures could result in serious injury or death. If just getting started, seek professional climbing courses offered by AMGA-certified guiding services. Be smart, and climb safe. At the surface, a daisy chain —a piece of webbing that features variable length loops—might seem like a great option for securing yourself to an anchor; however, this tool should not (and is not intended) to be used as part of your personal anchoring system. While many climbers elect to use them for this purpose despite warnings, improper use or an unexpected impact load on the daisy chain can result in catastrophic failure, and ultimately, danger to your life. First and foremost, daisy chains are intended to be used for aid climbing only, as manufacturers, like Black Diamond explicitly outline. They’re designed to temporarily withstand body weight—not dynamic falls. For aid climbing, daisy chains are safe tools, given that the rope should always remain in the system (i.e. if your daisy chain were to fail, you’re backed up by a dynamic rope, which can absorb the energy shock of a fall). This safety back up, however, is lost immediately when you untie from the rope at an anchor and rely solely on a daisy chain. Secondly, daisy chains (and Dyneema slings, for that matter), have no stretching capacity, meaning that not only do you substantially increase the load on your anchor system in the event of a fall, but a severe impact on the daisy could also cause it to snap immediately and compromise the other gear in your system. At this point, you not only put your own life at risk, but also that of your partner. In the event of a fall, the Daisy will not stretch, resulting in a severe shock load to you, to the anchor and to all gear in the system. That being said, many climbers are drawn to daisy chains specifically due to the fact that they feature multiple loops that can allow you to easily adjust your proximity to a point by clipping into multiple points; often referred to as “clipping in short.” Unfortunately, it’s easy to screw this part up when using a daisy chain. To perform this technique safely (when aid climbing), you should always use an additional locking carabiner to avoid faltering your security to the webbing. As you can see, it’s quite simple to incorrectly shorten a daisy chain, and its impact rating alone should make you question whether or not you’d want to put the weight of your life on it. While you can certainly secure yourself to an anchor using the rope and/or extra nylon slings, many climbers enjoy the ability to quickly clip into an anchor and adjust their distance from the master point—especially when cleaning an anchor at the top of a sport climb or before rappelling. Luckily, there’s a solution for these scenarios: a personal anchor system (PAS). Unlike a daisy chain, specifically designed anchor chains, like the Sterling Rope Chain Reactor or the Metolius’ Personal Anchor System (PAS) can serve as a safe, reliable means of securing yourself (and even your partner) to an anchor. 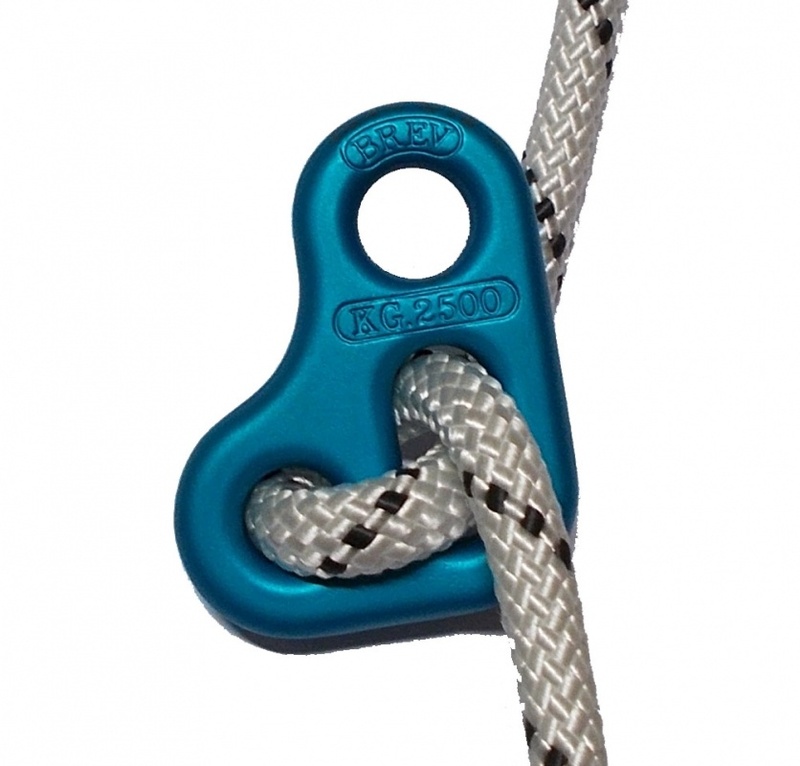 The loops on a PAS are each rated to full strength, meaning you can safely clip multiple loops, anchor points, and even your partner to its various loops. While a PAS is great for safely adjusting your positioning at an anchor, many PAS options, aren’t very dynamic (especially those made with Dyneema). In 2015, Petzl released two new personal anchoring alternatives, the Petzl Connect Adjust and the Dual Connect Adjust lanyards, which are made with dynamic rope (Petzl’s 9.5mm Arial), offering the benefit of being able to absorb more force than a daisy chain or personal anchor system in the event of a short fall. These devices also have an assisted locking mechanism that allow you to easily adjust your position with significant precision while building an anchor, belaying your partner, or preparing to rappel. Both are one hand adjustable and strength rated for one person, but the Dual Connect Adjust offers two arms usable for clipping into fixed lines and extending rappels. For simple personal anchoring purposes, the Connect Adjust provides ample features. For those who like being able to the use various anchor points for gear, their partner, or to equalize your personal anchor system, you might prefer going with a simple PAS. While there are surely numerous ways to create a personal anchor system while climbing, we do not recommend using a daisy chain for the reasons outlined above. As a rule of thumb, redundancy in your climbing is always desired, so perhaps it’s worth making a habit of throwing in a PAS and a clove-hitched rope at a belay, or cleaning the anchors with both a PAS and another sling to back you up. How much redundancy do you need with a PAS? It seems like overkill to use two of them, but what other options are there? You are not intended to you use two PAS devices, and I would not encourage it. I do recommend a second point of contact to the anchor, e.g. an extra quickdraw, sling, or a clove hitch to the anchor about 3-5 feet from where you’re tied into the rope. Having a point of contact in addition to your PAS will provide added redundancy should any single point fail. I have been using a P.A.S. that doesn’t get nearly enough love!! It’s by far my favorite rack item and makes me smile every time I use it. The KONG Slyde! It works very similarly to the Petzl Connect Adjust, and, because it utilizes recycled dynamic climbing rope, it’s by far the cheapest option.